Today's show is geared to the self managing landlord. 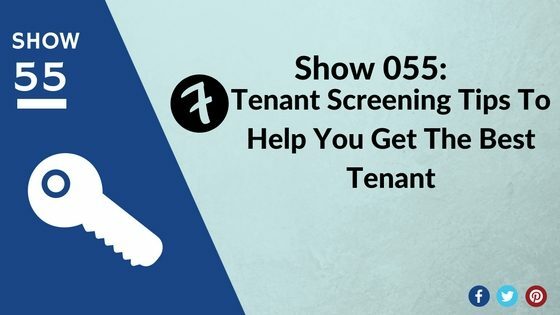 So whether you are currently managing your properties or plan to in the future, we discuss some of the most important aspects of tenant screening to ensure that you are choosing the best tenant out of your application pool. Tenant screening can be one of the most intimidating aspects of landlording because it is the process by which a landlord chooses and turns over his/her investment to another. Many times, rookie investors may rent to the first person that shows interest because they want to be getting money back into their pocket as soon as possible. What's important to understand is that in some cases it may be better to hold out for a good tenant then to let anyone in your property. Download Our Tenant Screening Checklist Don't let your property in the hands of the wrong person. Tenant screening can be one of the most critical aspects of owning a rental property. Grab a copy of our free checklist to guide you when it comes to choosing your tenant. Click here to download now. I have a question about how the mysmartmove.com functions. If a prospective new tenant does not have access to their email, can the landlord start the screening process without their involvement? This is assuming that their application has enough information and that they consented to the background and credit check. From my understanding of mysmartmove.com either the landlord can initiate the screening process or the landlord can pass that initiation process on to the tenant. The positive to having the tenant initiate it is that when it pulls credit it would be a soft pull for the tenant if they are the ones requesting it!